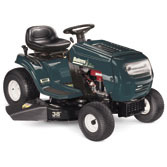 We purchased a Bolens 15.5 HP Manual Lawn Tractor from Lowes. We have less than 1.2 acre of grass to cut, so for the price, this riding lawn mower was perfect for our yard. When we decided to buy a riding lawn mower, we knew we needed one that was going to be easy for everyone in the family to use. As it turns out this mower is very easy to use and cuts nice and evenly. My daughter likes to drive it and she is 11. My 3 year old daughter likes to be ridden around the yard on it. It handles very well and rides smoothly. It turns corners very easily and smoothly and is easy to maneuver around objects in the yard. We have a trampoline and swing set back there and we haven't run into it yet. It has a 6 speed transmission, but there is no clutching to change speed. It shifts on its own, which is an awesome feature. Our yard has a small hill in the backyard and front yard, and the mower doesn't seem to lose any power going up the hills. It has headlights in case we have to mow towards evening. It has a double blade 38 inch cut, which isn't as big as some of the other pricier mowers, but is excellent for what we needed in our yard. This mower also mulches and can be adjusted to 5 positions depending on how short you want to cut your yard. It is very easy to adjust the height to your liking. We would recommend this mower to anyone who wants a good, dependable riding lawn mower, but doesn't want to pay a lot for it. It is perfect for a smaller yard, but wouldn't recommend it for a very large yard, over an acre, just because of it only being a 38" cut. It could take a little longer to mow a larger yard with this mower. Even with a new (designated by mfg) belt the mower blades just stop turning when run in deep (4 to 5 inch) grass. There is not enough height adjustment to mow high and then remow at a lower height. If you will notice, Bolens is running a 1/2 inch belt on 5/8 inch pulleys. If the pulleys are 5/8 than the belt should be 5/8 so it runs properly in them. If you put on the correct width belt of 5/8, of different length to compensate for the length distance, the blades keep turning when disengaged. It appears to me that there was an engineering error and rather then correct the error, they opted for the "quick fix" of a narrower belt. Running the narrow belt also causes it to wear out quicker. The belt also rubs on the belt guides which causes it to heat up. includes 50.00 to have it picked up and returned. This was the first mower I purchased as an adult when I was 21 years old. I am 29 now and I am still mowing with the same mower. I have had no issues what so ever. For the money I think 8 years and going is pretty good for a mower. Is it the best on the market, NO, but it has been a real good one. I have had a 15 hp Bilen for app. 8-10 years. Never changed blades. Cuts great. bought lawnmower 2 years ago,from internet, belt keep jumping off drive belt, try every thing,this is third belt put on last 2 months, anybody won't buy a bolen cheap. I can only recommend this mower to people who enjoy tearing things apart to fix them. I read through the troubles other have had and I can sympathize by having shared experiences. The engine it comes with is junk. Count on it blowing up. The Kohler engine I mentioned in an earlier posting is still working well. I still have to replace the drive belts yearly. Some sheet metal ripped so the mower shakes more than it used to. Like others I have had trouble starting it. I think the problem is related to the safety switches. If they are not pushed in enough the engine will not turn over at all. I have had better success starting it when I stand beside the mower with the blades disengaged and it in neutral then putting my foot on the clutch and taking my right hand and pushing down on the seat, the side of the seat where the pto lever is. Then turning the key. If that does not work. Get down on the ground and push the clutch. It should connect with a button. If the clutch misses the button it will not turn over at all. Loosen the screw and tilt the button forward so it can connect with the clutch again and retighten the screw. That worked for me last week. Good luck. I absolutely love my Bolens lawn tractor. I have had to John Deree 100 series lawn tractors and both of them are yard art. I wave at them each time I cut my 2 acre yard. The Bolens is very easy to operate and I love the short turns it make around my landscape and trees. Unlike John Deree, after so many turns, one wheel actually ran off the tractor past me. My husband and I had a good laugh, but I will only buy Bolens from now on. The only problem I have had with the Bolens is each time I have to spray the filter with engine starter prior to starting it, otherwise, it runs like a champ and it makes me so proud at the end of the day while I am surveying my yard and drinking a cold glass of tea under one of my Magnolia trees. So southern. Don't buy one, it's a waste of money!!! This is about close to nothing as you can get. From day one this mower would not cut grass, there is no way to adjust the belt tension and a new belt does not help, new blades and it leaves grass standing. I will make sure never to purchase one of these!!! I bought a Bolens lawn mower and after the first year it wouldn't start so had to take it in for new filters, etc. Then the second year the rivet broke where the lawnmower is started. MTD / Bolens didn't cover the repair even though it was still under warranty. Lousy product and service... I'll never buy this brand again. you can get the manual for this mower on line and print out. it tells how to adjust deck front to back and side to side. battery life unplug the lights. the come on when the key is on een if motor is not running. Unless there's been a major engine redesign recently, don't buy it. I purchased 15.5 HP M762F in 2005. Within 3 months it didn't run right. It would smoke heavily and then start shaking so bad I had to shut it off. Called warranty service. Surprise... it wasn't covered and cost me $163 because "my gasoline was old and had water in it" (it was new gas from a busy gas station). After a few years of not starting and buying new batteries, I finally gave up and started paying someone to mow for me. While talking to my neighbor about it this past winter, he said he had the same problem with his. When you shut the mower off, the gas somehow keeps going and gets into the oil pan. (Sorry, I'm a girl and don't understand how that works.) He drained it, added new oil, and then put a shut-off valve on the fuel line. The first time I tried it this year, it started and I thought I'd had a miracle and it was going to work. I was wrong. This past Saturday, it wouldn't start again, although battery was fully charged. It's doing the same thing... it makes a clicking noise, rather than the way normal battery or starter problems would sound. Yep... gas in oil again. I'm going to stick it on the curb with the key in it, hope someone takes it and then pray that they don't bring it back. Check your oil level. You may have too much in it. Bought my Bolen in 2004 and the only problem that I have had so far is that the carburetor was clogged up. Once cleaned, it has not given me any problems so far this year. I just bought a used Bolens due to needing a cheaper machine to cut grass. It started out well, cut the front, but when i went to do the side yard one of the blades fell off. Scared me to death. Anyone ever have this happen? eire031700@yahoo.com. It seems like a good machine in cutting the front acre, but this seems to dampen things a bit. THIS MOWER BELONG TO A FRIEND, 6 SPEED TRANS, BUT ONLY MOVES IN 5 OR 6 THEN AT HIGH SPEED, SOME TYPE OF A CHEAP VARIABLE SPEED PULLY SLIP SYSTEM, I'M GUESSING A NEW BELT WILL, WOULD FIX THE MISSING GEARS? DOES ANYONE KNOW? In September of 07 the front end of my Ranch King by MTD collapsed. The Briggs and Stratton 18 horse power twin v engine never gave me any trouble. I replaced it with the Bolens in September 07. In 08 I had no trouble mowing my 2.5 acres.In September 09 the drive belt disintegrated. If you care to try replacing the belts yourself there are two bolts under the foot pads and two bolts under that sticker with the warnings and such which resides between your legs as you sit on the mower. Then there are four bolts holding the seat to the frame. Remove those bolts and the back half of the mower can be lifted off. Since you are replacing the belts you might as well replace the tension springs too. I remove those by looping a piece of bailing twine around the spring hook and pulling with a big wrench on the other end of the loop. You will also need to loosen the belt pulley with a 5/8 " deep well socket. Then through pushing and pulling and rotating pulleys and fighting the belts eventually go on. Make sure the belts are inside all guides and tabs and reassemble. To keep from doing this procedure on a yearly basis I suggest you use a green Gates extra heavy duty 69x69 belt. The short drive belt does not get near the wear and tear and can be standard quality. Shortly after I spent all that work changing the belts and one month out of warranty and completely by surprise the engine blew up! To repair it I would have to replace the lower half of the engine called a short block. I did not understand how this could be. My previously Briggs and Stratton engine was practically indestructible and this one had catastrophic failure in two years. The only good thing about it was that it was the last mowing of the season and I had the winter to weigh my options. Ebay to the rescue. I found a Kohler Courage 15 horse power engine from a dealer on Ebay. It was in brand new condition but the engine model year was 04. By now it was Winter 2010. With shipping it was $250.00. It bolted on to the mower easy enough and the front pulley installed on the engine shaft easily. All the electric pugs where compatible. The only glitch was that the exhaust pipe to the muffler had to be unwelded repositioned and rewelded again and unless you have a welder you have to take tractor and all to someone who can weld it. I asked the guy who welded the muffler who is a small engine repairman why the mower engine blew up and he speculated that the valves needed adjusted. I said my old mower never needed that ! He said: "Thank you EPA!" So apparently modern mower engines are inferior due to government anti-pollution regulation and the valves need regular maintenance. 6-14-2011 The drive belts had to be replaced again. This time I used a Gates extra heavy duty green belt. Purchased this tractor in 7-1-10 moved the grass and on the third time the rocker arm assy came loose and the rocker arms fell into the cylinder for a Briggs engine I was very disappointed they used to make good engines this is junk. After fixing the rocker arms and re setting the valve clearance . when you first start it up and the engine is comming up to speed it jumps out of the parking setting ang jumps into gear giving you whip lash. Went to lowes to purchase a set of blades and they don't carry them or sell Bolens anymore. What a surprise there has to be a better mower than this. Bought in Mar. "08. Just finished overhauling the Brigs engine. The part around the drive shaft fractured. The one on top was OK.This was a strange looking part. Briggs & Stratton used to be a great builder of engines but everything ends sometime. I was fortunate in having a friend who assisted me in putting it back together. He used to repair small engines as a business. He had never seen a part like this either. Now I need a new belt that drives the wheels. About to give up due to Part # & Model #. Does this lawn mower have a battery charging system. I have a Bolens that we bought in 07? do they have transmissions? Do you change the fluid in the rear or transmission? This thing has been as reliable as my car. Bought in 2002. Still looks like new. I wax it a couple times a year and try to be diligent in regard to Maintenance. Actually changed the oil and greased, sharpened the blades, cleaned the air filter. Cranks every time. I agree that its a little noisey but arn't they all? Leveling the deck is a bit of a chore but, once completed seems to work as designed. The Bolen tries hard to keep up with my John Deere though it is no match. I still stay the Bolen can be a reliable low cost mower and it will perform well, IF maintained by the book. I have a 20 HP Bolen riding mower. It is hard to start, I've bought two new batteries for it and the safety switch on the deck handle won't work. The starter went out and I've only had it one year. It's been nothing but a pain for me because I'm on disability and don't need the headaches. I'm now having to pay someone to mow my yard. The mower just sits in my building. Not satisfied with it at all. I like mine, except for the fact that they do not make a bagger for it anymore. I have owned mine for 4 years now,never had a single problem.Cranks well,runs smooth,never even have to change the oil. I did recently hit a big tree root while cutting my grandmothers grass, and I bent the blades pretty bad. After I changed the blades, I noticed that my deck is not level anymore.Anyone know how to fix this? I called a few mower shops and noone around here will work on it. I bought my Bolen 10 yrs ago. I have run this thing into the ground mowing almost 7 acres of pasture. Last week I finally killed it by breaking the block. So, I either have to buy another engine since the rest of the mower is fine or get a new mower. I've had my Bolens mower from Lowes for a few months now and am quite happy with it. It's a good, basic, no frills mower, which is exactly what I was looking for. I don't need bells and whistles. I have about 2 acres with some substantial hills. Has plenty of power for me. I see a lot of power complaints, are you guys trying to brush hog with it? I adjusted my deck fore and aft and side to side, it was off a lot. Easy to do. That gave me a lot more height options with the adjustment lever. It will also mow in reverse if you disable the saftey switch on the forward/reverse lever. Just follow the arm down under the left fender, you'll see a single wire, unplug it. All and all does a great job so far, and have no doubt it will for quite a while. If I have one complaint, it's the muffler. It's loud, really loud to me, and I'm half deaf! We've had our bolen for about 3-4 yrs. treat it right it should last a long time. If someone wants a Snapper or cadet, John Deere etc... go buy one, but this little mower has served me well for the money. Bolens machinery, like all machines require a careful 'run in' before attempting to do serious mowing.Do not begin mowing until the transaxle has had time to run in. DO this by driving the tractor around (no cutting yet) for about 10 minutes.Now allow tractor to cool 30 minutes with the engine off.Repeat this 3 more times.Now ready for mowing. after mowing on a hot day ,always allow the engine to cool down.Do this by idleing the engine for 3 min. with the mower deck off.This inital break in with the after mowing engine cool down will greatly increase your machines lifespan. Check oil level before mowing,use stabil in the fuel.get to it. I was given a Bolens #13AM662G765 (15.5hp, 38") when I bought my house in 2008. I see why it came with the house - it's junk. I was shocked to find that it was only four years old. The battery runs dead, even with the headlight circuit unplugged. I have to jump it if it sits idle for more than 2 hours. The engine floods with fuel when the engine is shut off - I finally had to install a quarter turn valve into the fuel supply line to keep this from happening. The ride is rough at best. Fortunately I don't have much hill work. Torque is non-existant. It stalls out in heavy (8" grass, no matter how high the blade is set or how slow you go. Replacing the belt was a huge pain - there's no tension adjust, you just have to twist everything really hard to get the belt to slip on. I can't wait to buy a decent piece of equipment. Maybe then my wife or father would be willing to use it - they're both spooked by this thing! Bought it in Feb of 2006 so we are going into our 4th year with it. We have a 1/2 acre lot with a swingset and storage shed in the back yard. I can mow withing a foot or less without really slowing down and get the balance with a string trimmer. I have replaced a set of blades (got carried away with a grinder and got the original set way out of balance) and every year at the start of the summer I put a new plug and fuel filter on it, clean the air filter, change the oil and grease it. This year the battery wouldn't take a charge so I have to replace it. I really like the mower and the price (at Lowes) was affordable. A good buy for your money!! We bought this riding lawn mower at a sale at one of the Lowe's stores. We have mixed feelings about this lawn mower, and eventually found that we had to sell it. The tractor lawn mower just didn't work well for what we needed it for. The good things about this tractor lawn mower is that it was really efficient on cutting the lawn. The mower would cut it at a decent length, and it didn't require us going over it repeatedly. Overall it handled real well in the straight flat areas, and was good at tossing the lawn clippings. (We purchased an additional piece that would catch the lawn clippings.) It also was comfortable to ride, and wasn't too hard for an amateur to handle while cutting the lawn. Unfortunately, despite the good aspects of the Bolens mower, we had several problems with the system we purchased. In the long run, it was harder to deal with that to actually use our push mower. Therefore we ended up selling the system. The first problem we had was that it was difficult for us to start. It would take several attempts to start, and it would constantly stall. Despite our being careful not to stall it out, it would often stall as soon as we would start cutting. Also, when we were driving on our incline, it would feel tippy. It never tipped, but I always felt like I was going to tip over. The last problem we had with the system was that it was too wide. With the side projection, it made it too wide to maneuver into our back yard. It also took too much room up in our garage. In the long run, the mower was more headache than it was worth. Therefore we sold it and went back to the traditional push mower. I've had this mower now for two years and have had no problems. Yes, it does ride rough and yes it does not have the power of a v-twin with twice the horsepower but thats why it cost me 1/3 what a larger mower would. I have many maple trees and use it almost every other day in the fall to pick up leaves (I have the bagger) and it sure saves me a lot of time. Anyone can get a lemmon but if you treat it decent, don't drive it in sixth gear over holes and roots, it should last a long time. My neighbor has a new $3000.00 mower and it stays broken all the time. Mechanical lawn equipment can be a roll of the dice. Thanks for the comments. My yard is some what large but no where near an acre. Currently I have a gardner but it is getting too expensive. I would like to get a cheap but yet reliable riding lawn mower so i can cut my own yard and save money. For two months of paying a gardner, I could by a used but not old Bolens's. How do you like your Bolens tractor now that you have been using it for a while? I only ask because on many forums people insult Bolens alot but, those people never seem to own a bolens, they just seem to know someone who had a problem but they can't remember what the problem was.